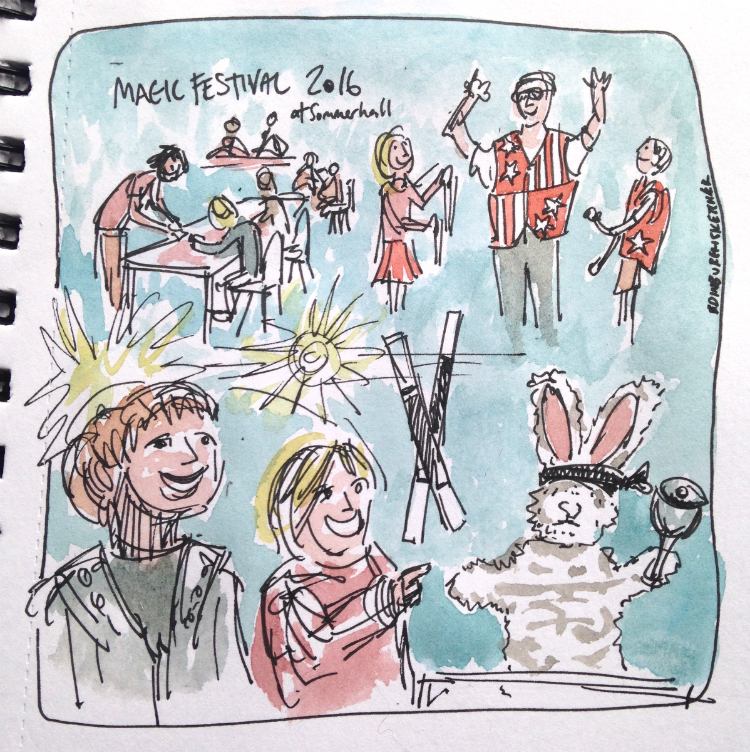 At the weekend the Sketcher Twins and I soaked up some Summerhall magic. The Edinburgh creative hub for the arts is home to studio and workshop spaces, and is situated close to the east end of the Meadows park in Edinburgh’s south side. It’s a favourite place for me, drop in for a coffee or bite to eat and there is always some interesting a new artwork or creativity to see. From the 1st to the 8th of July the venue, and others around the city has been taken over by the Edinburgh International Magic Festival. I took the twins there on Sunday for the ‘Magic Fair Family Morning’ which ran on Saturday and Sunday. The entrance fee of £12 (under 7’s were free, children over 7 £7), got you 4 hours of access to various magic shows, magic related craft and even a mini magic school. The twins loved it (as did I – the magicians were very funny) and combining the shows with the arts and crafts was a good way of breaking up the day and avoiding too much queuing or waiting around. Although that particular session was only on for the weekend there are plenty of other shows to see before the finale on the 8th July. Click through the links below to find out more, and remember to book the Magic Fair Family Morning next year! The sketch above was drawn from photos taken on the day, in black ink and watercolour.